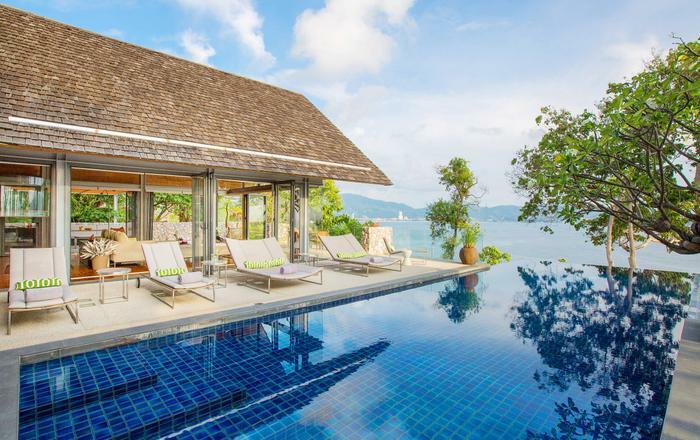 Villa Belle is a spacious and luxurious uber stylish 3 bedroom villa set in lush tropical surroundings designed to encompass wide vistas of the azure gulf of Siam and Koh Samui's neighbouring islands. 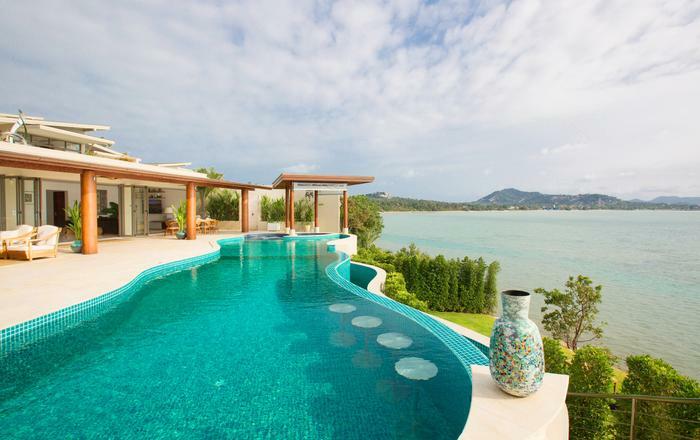 Located on the much sought after north coast of the island, the villa is a short distance to the nearby golden sands of Choeng Mon beach, rated by many as one of the most beautiful beaches on Samui. 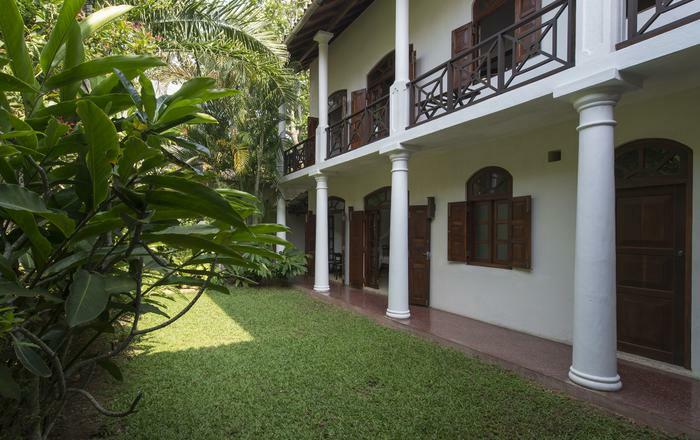 Villa Belle's private garden with impressive feature slate walls and ornamental ponds fringed with traditional Asian carvings leads guests to the uniquely designed wrought iron main entrance. Once inside the impressive vaulted ceilings exude wow factor: the open plan living space is flanked by floor to ceiling disappearing walls of glass that blur the divisions between indoor and outdoor living. Soft colours of white and cobalt blue blend with the beautiful coastal surroundings mingled with soft black accents creating an interior designers dream villa, with impeccable attention to design detail. 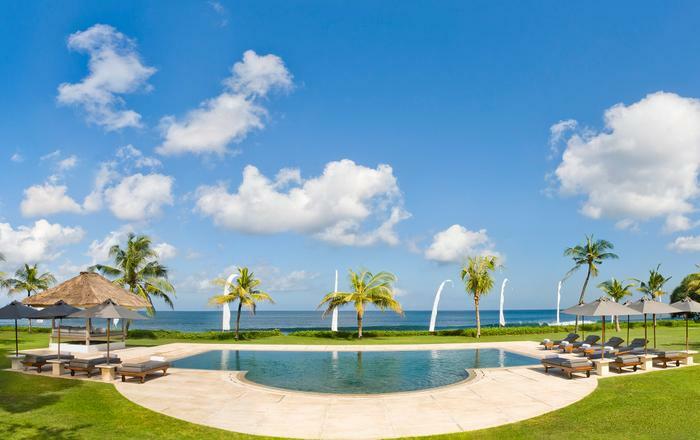 The crowning feature of Villa Belle is the wrap around expansive wood terrace that unfolds to feature an 8 metres Balinese style infinity edge swimming pool. There is no better place to spend a day of relaxation. In the evenings sink into the marshmallow white sofas and oversized rocking chair that ooze the essence of comfort. Watch a movie on the state of the art LCD TV/DVD entertainment surround sound system that encompasses a multi-channel satellite and an Apple TV system, all adding to that perfect holiday ambiance. The open plan living area encompasses a fantastic chef-designed gourmet kitchen and breakfast bar, highly appointed with top of the range appliances and accessories. The large antique dining table has a commanding location drenched in sea views offering formal dining for up to 8 and there is expansive outdoor lounge sofa seating with BBQ deck for that ultimate alfresco dining experience. All three bedrooms are designed with the utmost luxury in mind. Exquisite four-poster beds reside commandingly bathed in light coming through the oversized windows. Each room is fitted with individual entertainment systems and furnished with sofa seating so as to enable guests to enjoy some of their own quiet time. The outstanding sunken terrazzo baths are distinctively situated in the open plan bathroom area, which fits seamlessly into these stunning bedroom retreats. This individual design enables guests to indulge in a truly exotic in-room plunge bath with chilled terrazzo bench seating for an exceptional luxury pamper time. For guests desiring a speedier turn around the centrally suspended power rain shower adds a twist of lavishness drenched in picturesque views. 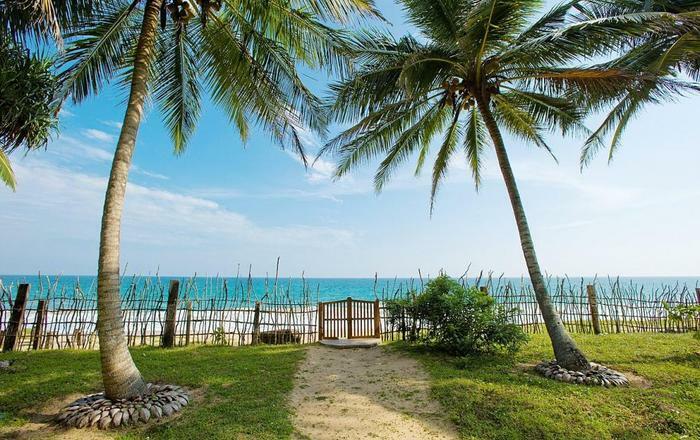 The staff at Villa Belle are courteous, friendly and professionally trained, focused on providing personal service to assist guests with identifying the best Villa Belle has to has to offer in luxury accommodation. This impeccable attention to detail ensures guests needs and desires are experienced fully in truly extravagant Villa Belle style. The staff were amazing and the villa is stunning! many thanks to noom, pa and joom for treating us so well. what a wonderful stay. the best staff we have ever experienced on holiday!! Dear yehuda, thank you so much for a fantastic vacation. my friends and i had the time of our lives and we owe it all to you and your wonderful staff. please convey our gratitude to nong and the rest of the team. they did an excellent job keeping the villa comfortable, safe, and pristine at all times. they were professional, warm, kind and fun to be around and did above and beyond what was expected of them. if there is one thing that separates villa michaela from the rest of the beautiful villas in samui, it is the presence of a welcoming family that awaits you the second you step into the house, constantly ready to attend to your every need. aside from the staff, the facilities and amenities were superb. the rooms were luxurious, the cinema room was cozy and well-equipped, the kitchen was a constant source of delicious food for us, and the beautiful infinity pool offered the most spectacular view of the island incomparable to any that we’d seen elsewhere. the proximity to villa belle just up the hill was an added bonus; since we were traveling with a large group, it was the perfect way for all of us to stay together, yet have enough room to live comfortably. all in all, our stay was nothing short of a fairytale and we would not hesitate to return to villa belle if we are ever in thailand again. we will definitely recommend belle to anyone who asks for our opinion on where to find the perfect vacation experience. thank you so much once again. Hi yehuda, it was amazing!!!! everything was perfect and specially the service!!!! so helpful!!! the food outstanding!! the massage as well!! everything !!!! the house is superb . our only problem was that we had no water and no light one night because of the storm. but that's it. count on me for any positive review. thanks again for the best villa rental ever. We really had a great time in koh samui, specially the villa was amazingly beautiful. it was one of the best properties i have ever stayed at, it was perfect in terms of location, property and value for money. also i would like to mention that you have an amazing staff, both our villa manager "noom" and "kum pha" were really nice and helpful, they did a lot for us and made our stay all the more special and worth it. i would definitely love to come back and stay in your property again. 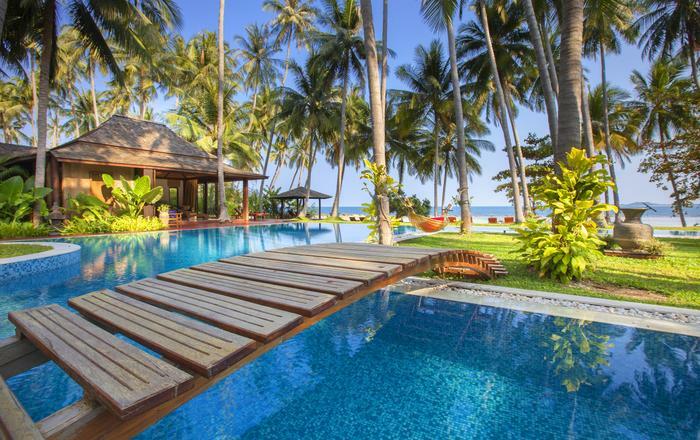 , we really had a great time in koh samui, specially the villa was amazingly beautiful. it was one of the best properties i have ever stayed at, it was perfect in terms of location, property and value for money. also i would like to mention that you have an amazing staff, both our villa manager "noom" and "kum pha" were really nice and helpful, they did a lot for us and made our stay all the more special and worth it. i would definitely love to come back and stay in your property again. We stayed at villa belle for 10 days in april 2012 and had a fabulous time. 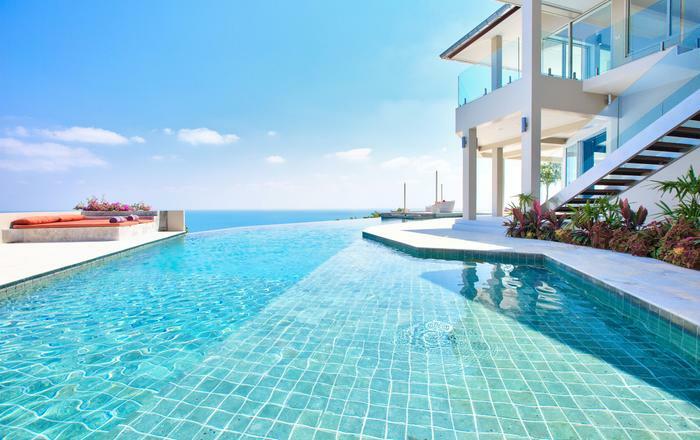 the location is truly idyllic – you are only 5 minutes from cheong mon beach but at the same time benefit from the most amazing ocean vista in three directions, being one of the highest villas in the area. you are not overlooked by anyone, so privacy is assured. the villa itself has a truly unique character with high ceilings and an integrated terrace that forms part of the living area – tall windows ensure a constant pleasant breeze even on the hottest days. the staff are great and nothing is too much trouble – khun pa has an extraordinary repertoire in animals made from towels(!) and khun noom can make a great cocktail alongside all his other talents. "highly recommended!" *Airport Transfers charge: USD 50 per way and for all guests.